Take a stroll where every step brings a new giggle as Blackpool welcomes a brand new floor covering with a difference. 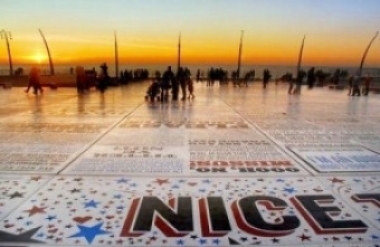 Blackpool’s brand new Comedy Carpet sits in the shadow of the world famous Blackpool Tower – and it’s one of the largest pieces of public art ever commissioned in the UK. There’s nothing like the British sense of humour, and a visit to Blackpool’s Comedy Carpet is a bit like a trip to the Hollywood Walk of Fame; but immortalising and celebrating the jokes, songs and comedy catchphrases of Britain’s most well loved comedians and writers. It’s been called the horizontal Angel of the North – a must visit spot. Artist Gordon Young, in association with leading design agency Why Not Associates, created the Blackpool Comedy Carpet. Gordon also designed the climbing towers that greet visitors as they arrive from the M55 motorway – his work is all about creating art, which has relevance to its surroundings. 850 writers and comedians are represented on the Comedy Carpet – with letters ranging in size from a few centimetres to almost a metre tall so that the laughs can be enjoyed from all sides and from both close up and at height from the Tower. The traditional music-hall style playbill inspired the huge 1880 square-metre magic Comedy Carpet experience. With loads of laughs, this is the very latest in a long line up of stars of Blackpool’s entertainment history. The carpet is part of Tower Festival Headland – a brand new events space in the resort, which will host huge events with a capacity of 20,000 as well as a brand new low-carbon-emission wedding venue with breathtaking views across the beach and sea.